Cyprus property market continues to show significant growth and interest from buyers, both local and foreign citizens. As the result of this interest there are many new construction projects all over the island. One of them will be launched next month in the prestigious area of Limassol. Unique residential complex developed with the world’s latest architecture & planning trends in mind. Residents will enjoy unbelievable see panoramas and the exceptional atmosphere of comfort and relaxation in the elegant gated community with exceptional in-door facilities like common pool, gym, tennis court, green area and underground parking. 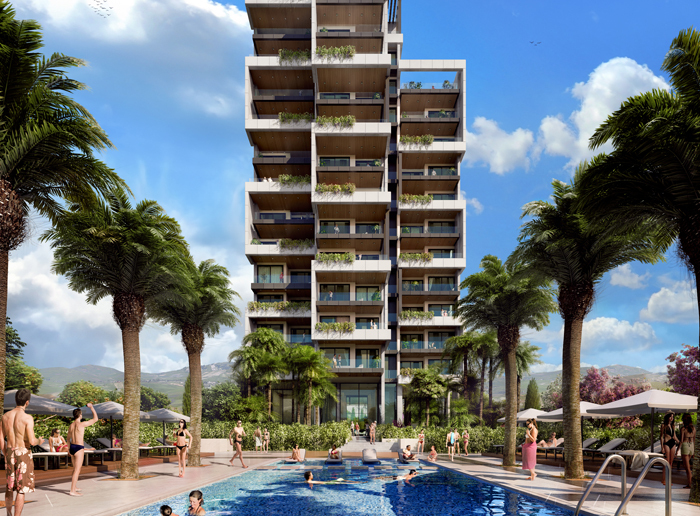 The complex blends ideally in the urban landscape of the sought after tourist area of Limassol thanks to the well-balanced mix of sophistication, comfort and modern design. Limassol’s best sandy beaches, shops, restaurants and other holiday pleasures are in a stone’s throw. The development comprises 37 one-, two-, three- and four- bedroom luxurious apartments, penthouses and duplexes with private pools on the roof. Most of the apartments offer breathtaking views of the Mediterranean sea, Limassol city and its picturesque hilly suburbs.